Mafia 2 is a pretty fun game. It is a lot like Grand Theft Auto only set in the 50s and probably with a lot less car jacking. The Logitech G13 works really well for the game since it is a third person shooter. I made a profile for the Logitech G13 that has worked well for the game. It is a basic FPS style profile with a few extra keys added to the game specifically for climbing, hostering, crouching anc covering. 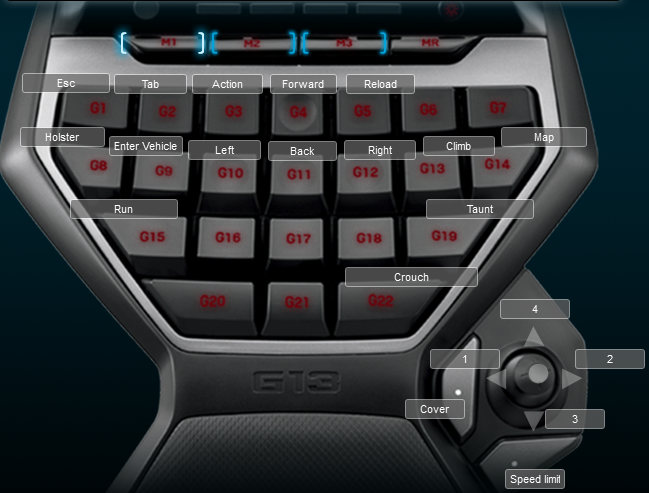 Below is an image of the keyboard layout for the profile.